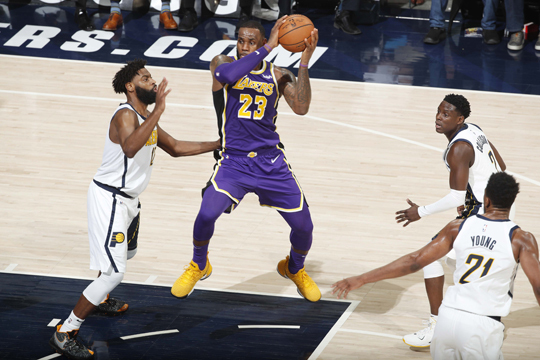 Los Angeles—The Indiana Pacers humbled the Los Angeles Lakers 136-94 on Tuesday, handing Lakers superstar LeBron James the biggest margin of defeat of his NBA career. Bojan Bogdanovic scored 24 points for the Pacers, who tied a franchise record with 19 three-pointers. That milestone notwithstanding, James endured the most lopsided defeat of his career, having previously twice lost by 36 points.Meanwhile, defending champion Devin Booker will go up against Curry brothers Stephen and Seth as well as NBA veteran Dirk Nowitzki in the All-Star weekend three-point contest later this month, the league said Tuesday. Phoenix Suns star Booker won last year’s three-point contest with a record 28-point final round. He defends his title in a field of 10 sharp-shooters that will include Golden State Warriors star Stephen Curry and his brother Seth -- who plays for the Portland Trail Blazers and is shooting an NBA-high 48.5 percent from three-point range this season. The three-point contest will be on All-Star Saturday on February 16, on the eve of the All-Star game in Charlotte, North Carolina. It will be a homecoming for the Curry brothers, whose father, Dell, played 10 seasons for the Charlotte Hornets. Stephen Curry will be appearing in his sixth three-point contest. He won it in 2015, but skipped the event the past two years. He has also been voted a starter for the All-Star Game. The field includes 2019 NBA All-Stars Damian Lillard of the Portland Trail Blazers as well, along with Khris Middleton of the Milwaukee Bucks and Kemba Walker of the Charlotte Hornets as well as Danny Green of the Toronto Raptors, Joe Harris of the Brooklyn Nets and Buddy Hield of the Sacramento Kings. In other All-Star Saturday action, Charlotte Hornets forward Miles Bridges, Atlanta Hawks forward-center John Collins, Oklahoma City Thunder guard Hamidou Diallo and New York Knicks guard Dennis Smith Jr. will showcase their aerial artistry in the Slam Dunk contest.